The eye-catching Cartwheel galaxy looks like a gigantic cosmic wagon wheel. Fritz Zwicky discovered the galaxy in 1941 and considered it one of the most complicated structures needing an explanation. This spectacular galaxy is the result of a rare and violent head-on collision with a smaller galaxy. 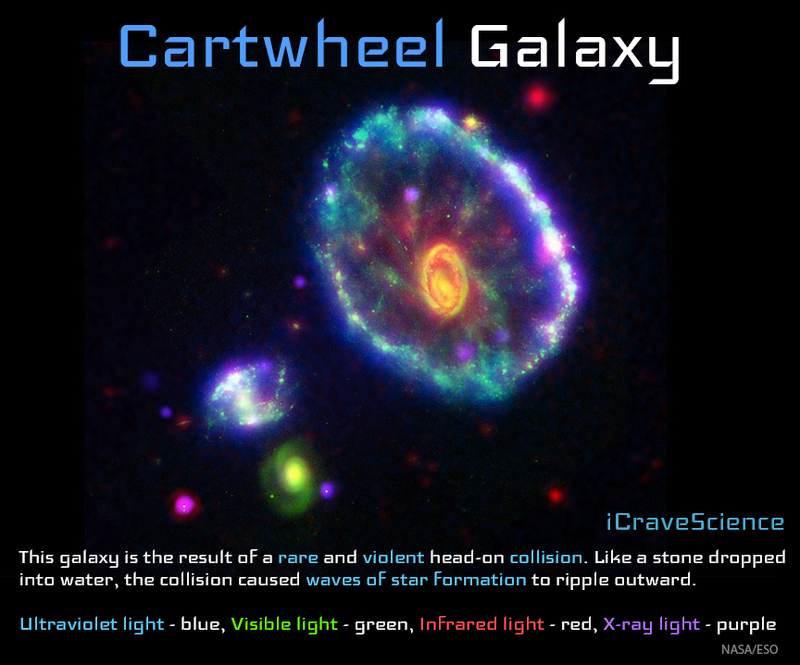 The cartwheel galaxy was likely a spiral galaxy very similar to the Milky Way. Approximately 100 million years ago, a smaller galaxy smashed into the heart of the large spiral. 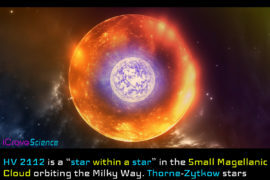 Like a stone being dropped into water, the violent collision caused intense waves of star formation. These ripples ended in the brilliant ring forming the galaxy’s “cartwheel”. 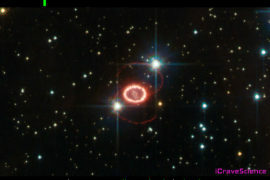 The ring is one of the brightest ultraviolet sources in the nearby universe. The bright blue color is the result of several billion massive new stars, 5 to 20 times larger than the sun. The brightly colored image from NASA is the result of several combined telescope images. The Galaxy Evolution Explorer detects ultraviolet light and is displayed in blue. The Hubble Space Telescope detects in visible light and is displayed in green. The Spitzer Space Telescope detects in infrared light and is displayed in red. The Chandra X-ray Observatory detects in X-ray light and is displayed in purple. The pink clumps, surrounding the blue, are likely binary star systems containing a black hole. They are known as “Massive X-ray Binary Systems”. Scientists believed the outer blue ring was the extent of Cartwheel; however, the Galaxy Evolution Explorer detected another faint disk extending to twice the diameter of the blue ring. This makes the Cartwheel galaxy a monstrous 2.5 times larger than the Milky Way. 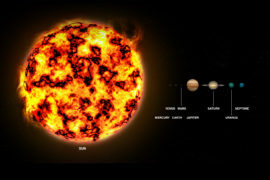 Violent and chaotic events in the universe continually provide us with spectacular cosmic scenery.